Delta 1172 Tenoning Jig. 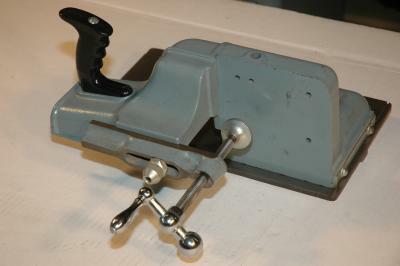 Heavy cast iron tenoning jig for use on Delta table saws. Also worked on shapers. This heavy (approx 30 pounds) holds stiles or rails or other narrow pieces securely for cutting tenons on the ends. This is a far superior jig to the cheaper lighter versions sold today. These sell used on Ebay between $250 and $350. If you've got one of these, keep it. They are hard to come by. I had this jig for a lot of years, is there a manual available? I am looking for information on all the threaded holes in the base plate, were there accessories. I would like to purchase one or more of the Delta 34-1172 tenon jig. Please contact at whornby@windstream.net or254-654-0910. In the middle of the previous century, a man bought one of these for his new wood shop. He used it for many years finally handing it off to his son. The son also used it for many years finally handing it off to me. I am so honored by this piece of arn! I found one of these Deltacraft 1172 tenoning jigs in an old barn. I cleaned it up and relocated the guide bar 1 3/4" to the left, and it seems to work just fine on my Delta 10" hybrid.